In this ever changing world, the option to have a utility vehicle to meet a wide array of demands is more appealing than ever. Purchasing a vehicle purely as a toy might fit a few, but imagine a functional machine that also packs enough punch for weekend fun! Kawasaki’s motto for the Teryx has been, “Unleash your inner outlaw” and it will do just that. So, when faced with the ultimate showdown between work and play, the Teryx should be your weapon of choice for this duel! When the dust settles and the fun begins, the Kawasaki Teryx will be your Huckleberry. 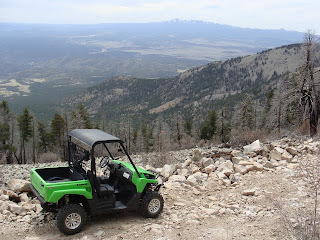 So what better place to test the Kawasaki Teryx 750 FI 4×4 Sport than in the great Southwest! Where there are miles of wide open places, dusty trails, rugged terrain and scattered old ghost towns. 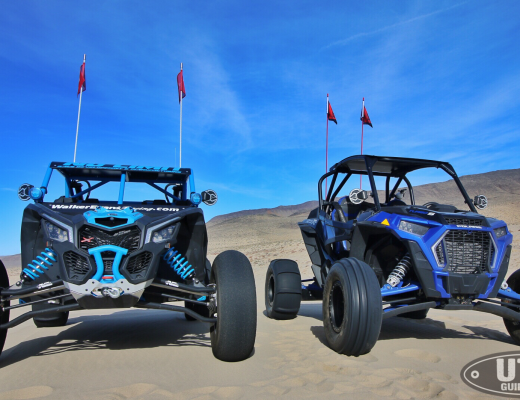 Any outlaw should feel at home here and we put the Teryx through the ringer to see if it did just that. 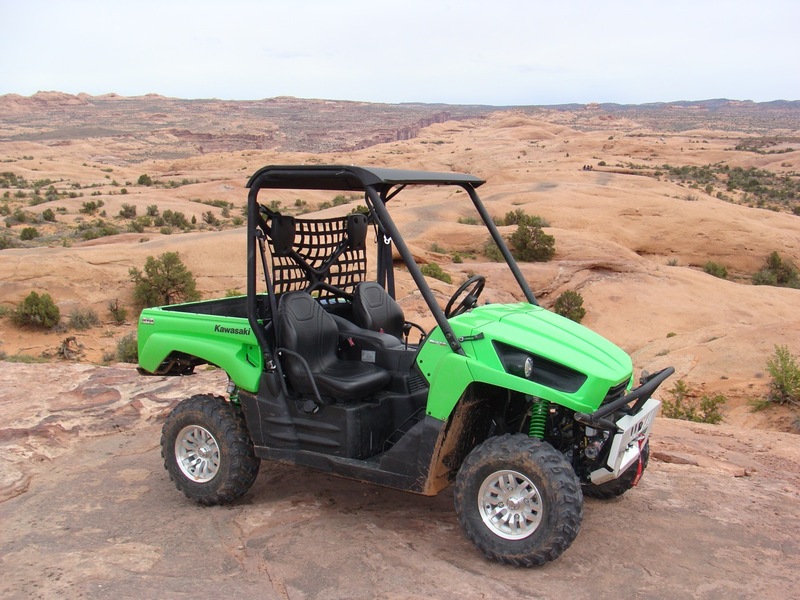 Our test Kawasaki Teryx Sport is considered as the hot rod of the Kawasaki RUV (Recreation Utility Vehicle) family, but don’t let the Sport badge fool you. This workhorse has a tilting cargo bed that has a 500-pound capacity and its reinforced bed frame offers maximum rigidity for excellent durability. Don’t think the bed is just for hard labor, it also makes for a pretty nice table or seat for tailgating while out on the trail or around the campfire. This feature was very popular, especially around other UTV owners in the gang as they were left standing while I had the luxury to kick back and relax. Another big utility oriented feature that comes standard on the Teryx is the full size 2” receiver hitch. This sounds like a no brainer, but there are other UTV’s on the market that come with a puny 1 1/4” receiver. With the Teryx you can quickly connect any 2” sized hitch that you might have laying around from your car or truck and tow up to 1,300 lbs of sweat equity or even your most prized possession. 1,300 lbs is a significant amount, but at the heart of this trusty steed is a 749cc SOHC, liquid-cooled, four-valve-per-cylinder fuel-injected, 90-degree, four-stroke V-twin engine. This air ingesting, gasoline pumping power plant will give you enough giddy-up-and-go to scoot through the country or pull those hefty loads with ease. Pulling might be one thing, but stopping is another! The dual front 200mm disc brakes are clinched by rigid-mount 27mm twin-piston calipers and provide powerful, fade-free braking. The rear brakes are sealed in an oil-bathed multi-disc system that provides worry free braking in almost any condition. Since the rear brakes are sealed to outside contaminants, there is less maintenance and reliable braking while in the dirt, muck or snow.Whether you’re talking utility or sport, a solid 4wheel drive system is a must. 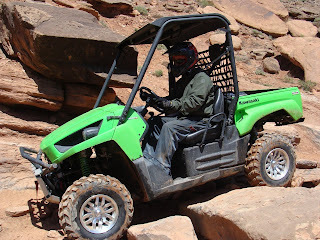 Kawasaki has done a great job of integrating an adjustable and durable 4 wheel drive system into this platform. There is a conveniently located 4WD switch on the dash for moderate duty. Also, there is a variable front differential lever next to the gear shifter to distribute torque equally to the front wheels for maximum traction. The rear gear case keeps the rear wheels locked and turning together for maximum forward thrust and performance. All of this combined with lightweight alloy wheels, 26” tall Maxxis tires and multi-adjustable gas-charged shocks, make for a smooth ride across a wide array of rough, off-road terrain. The Teryx also boasts 11.6 inches of ground clearance and a width of 58.5 inches. This wide track provides for a stable ride while cornering on uneven terrain, but is still narrow enough to fit in a standard pickup truck bed, a win-win! Packed to the gills or parked on a hill? 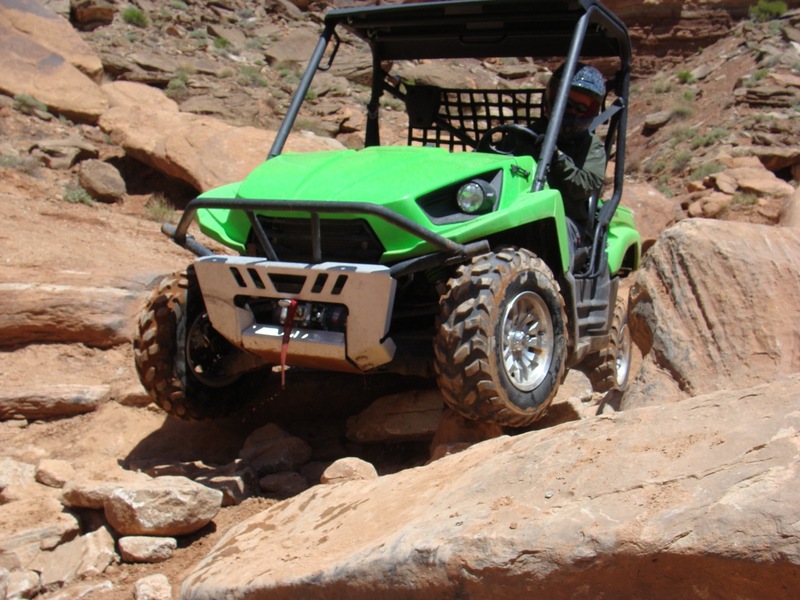 Not to worry, the Teryx also comes equipped with a parking brake. You will never yank the gear selector and cringe at the sound of grinding cogs! There is also a safety built into the parking brake when it is engaged. This is a feature that keeps the operator in-tune with the vehicle and extends the life of the parking brake. Another creature comfort that the Teryx excels in is the seating position. The seating position enables you to clearly see all the obstacles in front, on the side and directly behind. It’s ideal for ingress and egress and there is no wasted time by “crawling” into the vehicle. The seats themselves lack a little if you’re sport oriented, but they do the trick for utility minded folks. Same goes for the non-tilting steering wheel. The fixed position isn’t bad for my 6?1 frame, however it could be awkward for others and should be adjustable in the sport model. Storage is another plus. There is a lot of accessible space in it compared to the competition. The glove box on the passenger side is large, seals well and is easy to reach. The slide-away cup holder is a neat feature as it is centrally located, high up on the dash and can be stowed away when not in use. Hopefully, one would never have to lift the hood, but in the event that this is needed, the Teryx will accommodate. A hinged, forward-tilting front hood and headlight assembly make accessing the front of the vehicle a breeze! This makes for effortless access to the radiator and front suspension components for maintenance and suspension tuning. The hood and the rest of the exterior bodywork is constructed of Thermoplastic Olefin, which has a high-gloss finish and is more scratch resistant than polyethylene. So it has utility, sport and looks – a triple threat! With all these great appointments and features, the Kawasaki Teryx 750 FI 4×4 Sport is well rounded and is worthy of the UTV name that it is synonymous with. It is a true Utility Terrain Vehicle that can be used for work, sport or just plain fun! If all the above features aren’t enough, Kawasaki has an entire lineup of useful accessories that can be purchased on Kawasaki’s website or ordered and installed at your local dealer. Have more questions? Please visit us over at TeryxForums.net for all discussions pertaining to the Kawasaki Teryx!